Last night, Jerry and I told Noah about Paolo. The kids at the party kept asking where the fourth cat was, and I just kept changing the subject. Once all the kids went home, and we settled down for the evening, we told him what happened. He was very upset, which is what I expected. Noah takes after me in that he's really sensitive, and he really loved Paolo. We talked about it for a little while, and he's okay now. This morning was pretty relaxing, which felt good after all the chaos of the birthday party yesterday. It was thunder storming all morning, so I read a book for a while, and then I really had the urge to go for a run. 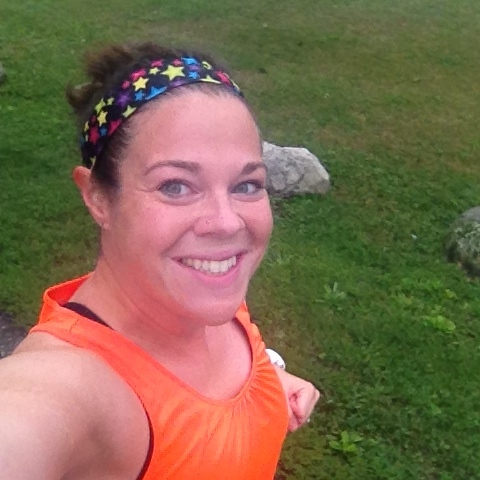 It was perfect running weather (for August, anyway)--65 degrees and overcast. Yesterday, my knee felt completely fine all day, so I decided to try an easy three-miler. I stayed close to home, just in case my knee gave me trouble. I started running, and my knee felt 100% back to normal! I was so excited. 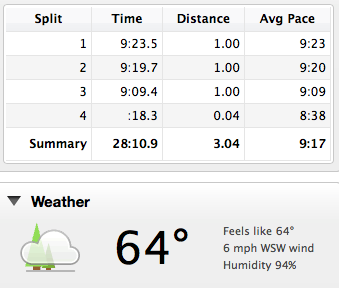 I was surprised to see that my first mile was 9:23, because I was expecting to see 10:30-ish. I decided to aim for negative splits without trying too hard. Second mile was 9:20, and then third was 9:09. My knee didn't give me any trouble at all, and I felt fantastic! I always write about how I hate running (only half-jokingly), but the truth is, I would be lost without it. After only three days, I was really itching to go for a run! I love how good it makes me feel, and when I'm taking it easy, it's actually enjoyable. It took a long time to get to that point, though--I was running for about a year before I felt like I was hooked on it. I used to think it would be detrimental to my training if I took time off, which is why I stupidly kept marathon training when I had a knee injury in 2012. On Tuesday, when I knew something was wrong with me knee, I decided to take time off of running until it felt back to normal. Luckily, that was only three days! If I had kept running on it, I'm sure it would have taken much longer. This afternoon, we went to Sam's Club, and it was CRAZY in there. People were leaving the store with carts piled high with bottled water. We saw one person who had an entire U-Haul van packed full of cases of water. There were people rushing to the back of the store, where the water is shelved, shoving past people, and practically running us over with their carts. It turns out that Toledo is under a state of emergency with an alert not to drink (or use, in any way) their water, because it's contaminated (and boiling it would only increase the toxins). I live about 20 minutes north of Toledo, and there were a few cities just south of us that were affected as well. Luckily, our city isn't affected, but that could change, depending on what the cause of this whole thing was. All of the stores around here are completely sold out of bottled water, because it just flew off the shelves. Sam's Club is about 30 minutes north of here, and there were people driving up there to stock up. Sam's had a TON of water, but at the rate people were buying it, they'll probably sell out today or tomorrow. I was just in awe of the whole situation at Sam's. Hopefully the issue doesn't last long--I can't imagine not being able to use any tap water! I feel bad for the people in Toledo. People were coming to Ann Arbor this afternoon. The Ann Arbor News said that the Sam's and Costco would be sold out by closing time. People are even hitting the stores in Jackson now. The grocery store in Chelsea is sold out of water. It should be easing up by now. They've been handing out water at the local schools and all the local stores are stocked back up with water. I was just at Kroger a couple hours ago and they had tons of water. I think people were just panicking, which is understandable since they originally told us we couldn't even touch the water. They've since told us that healthy adults could bathe, but we still can't drink it or wash dishes or rinse off produce and the like. All the grocery stores had to throw out their fresh produce because they have those automatic misters. All the restaurants are shut down, too. It's both scary and annoying! Oh my gosh, it took me like five minutes to make the connection with the post title. Ha ha ha, that was really clever!! Glad your knee is feeling better!! I'm about an hour east of Toledo, and people were sending up truckloads of water. Our Walmart had a 5 gallon limit Saturday and yesterday to keep from selling completely out (but no limit on bottled water), but it was going really fast. It's definitely a rough situation, but it was so nice to see so many people going out of their way to help out! I'm south of Cleveland, and we keep waiting for the algae bloom to hit here, but so far so good. I should have picked up some water just in case.